Pretty much all WPTools features are supported in DocX format. Only proprietary WPTools objects, special user properties and sub paragraphs cannot be saved in this format. New: It is now possible to write an marker in the file to make MS Word open the file in track changes mode. We took care to also save WPReporter band information into regular fields so it is possible to save in DocX, edit a template in MS Word and load the template back. Here you can order the add-on if you have licensed WPTools 7.23 or later – it includes the source for the DOCX reader and writer. The demo was compiled with WPTools 7 “Premium“. This demo lets you “play” with the word processing features of our text components. It is just a prototype and comes without any warranty of any kind. In the lower right corner it print “www.WPCubed.com”. WPTools uses reader and writer classes. This makes it possible to – even in the standard version which does not contain all of the source code – to extend or to modify the way files are loaded and saved. The latest programming techniques have been used to make the reading and writing fast and save. 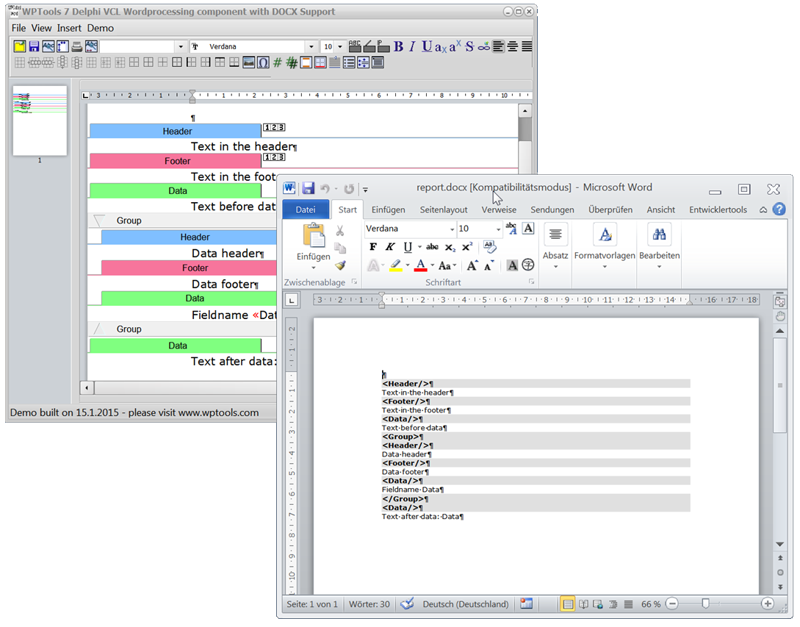 WPTools reads and writes its own “WPTOOLS” format, ANSI, RTF and HTML/CSS texts. There is also an add-on to support MS Word DocX files natively, too. WPTools uses an extensible concept to support file formats. It is possible to create and adapt reader and writer classes. Unlike HTML XML requires a clear nesting of tags, this means that each XML TAG has to be closed on the level it was opened. But this would limit the capabilities of WPTools. There are several elements which can be closed on a different level, i.e. hyper links. A hyper link (<A>) can be opened somewhere within one paragraph and be closed within the next. The same is true for bookmarks and of course mail merge fields. So we decided to create the “WPTOOLS” format to be HTML like, this means it works with TAGs which are using named parameters. The intention was to make the WPTOOLS format readable by HTML readers. Not only to display it in a web browser (which works) but to use it as input for an indexing system. So all indexing systems which can handle HTML can also handle the WPTOOLS format. A general HTML reader will see the plain text and the tables in WPTOOLS format and ignore the embedded images since they have been embedded Base64 encoded escaped by HTML comments. Paragraph styles are defined with a “pstyle” tag which also sets a number for the style. The style attributes are encoded in wpcss format which simply list the attribute name:attribute value. 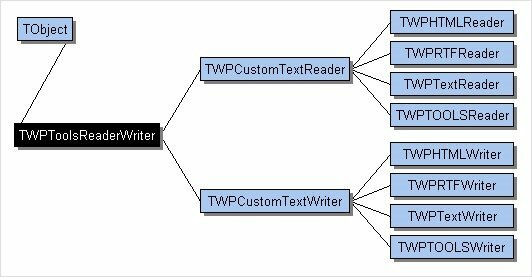 Within WPTools API the attributes can be set suing TParagraph.ASet( id, value ) and read using TParagraph.AGet( id, var value ). Later the style can be referenced inside the div tag using the base attribute. Character attributes (within WPTools API they are represented by the CharAttr integer which are stored with each character) are first defined using the “cs” tag and later applied using the c tag.